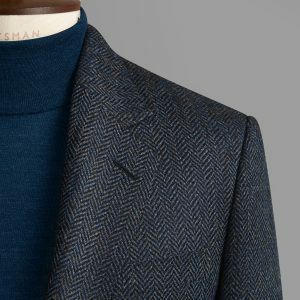 Huntsman’s Autumn Winter 2017 Ready to Wear Collection celebrates a heritage that spans three centuries. 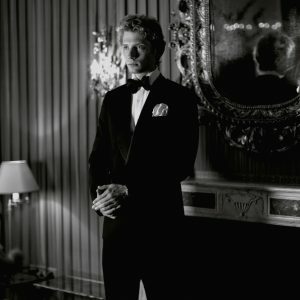 Inspiration comes both from the house’s extensive archives and from Creative Director Campbell Carey’s experience in bespoke tailoring. The result is a timeless wardrobe of elegant pieces working together to offer an outfit for every occasion. At the heart of the collection, as ever, is the house’s iconic single-button jacket, with its slim silhouette and tapered waist. 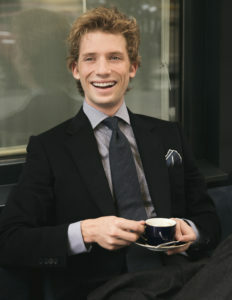 Our standout design this season is the Cashmere Sports Jacket, available in two colours, Green Dorset and Blue Sussex. It features a ticking check design recently discovered in our archives by Campbell and brought to life in collaboration with Joshua Ellis, to celebrate the cashmere manufacturer’s 250th anniversary. Sourced from inner and outer Mongolia, the cloth is made up of eight yarns, which are twisted together to create a luxurious finish and remarkable depth of colour. Originally available only in bespoke, its move into our ready-to-wear line evidences the way our activities inform each other. without a jacket. This slim cut is also available in three different check designs of varying boldness, from subtle to statement piece. Campbell’s intuitive understanding of cut and styling can be seen at its sophisticated best in one of the collection’s highlights, our Midnight Blue Evening Suit. While black is the more traditional choice for evening wear, our suit is inspired in part by Daniel Craig’s rule-breaking midnight blue tuxedo in Skyfall. 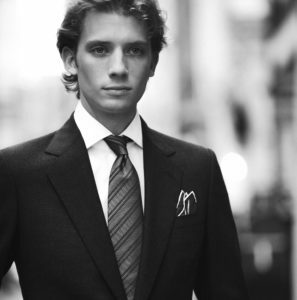 The matt finish of a hopsack weave contrasts with the lustre of a satin lapel, the curves of which have been designed to sit higher on the torso, giving the impression of a longer waist line. A further highlight is the one-button Fresco Suit in a dark grey hopsack, the open weave of which makes it ideal for travel, thanks to its incredible recovery and crease resistance. 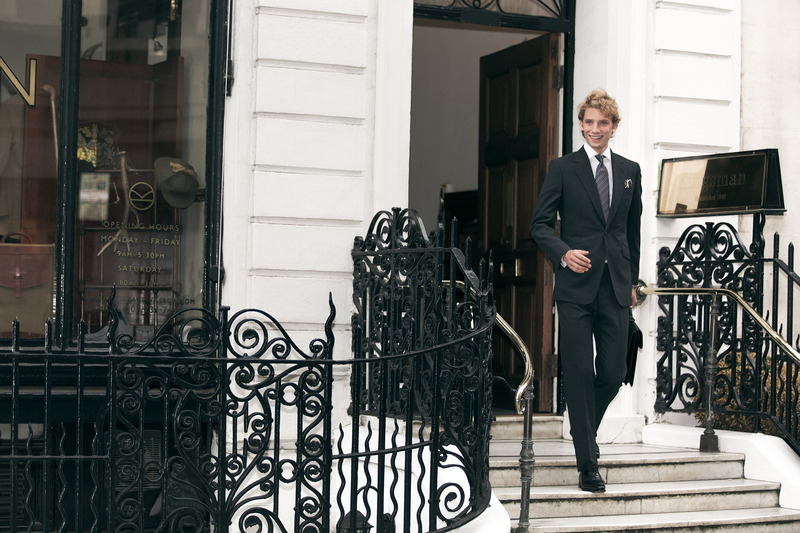 Comfortable and breathable even in warm weather, this suit can take its wearer from an autumn London to a warmer climate in style. The season sees the continuation of a second successful collaboration, this time with Jermyn Street shirt maker Turnbull & Asser. 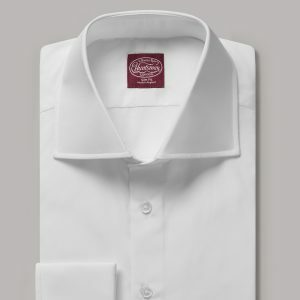 Huntsman shirts are made from 100% handpicked Egyptian cotton and offer a choice of two floating collars – the Huntsman and Hammick – which combine with classic and slim fits to give customers the flexibility they prefer. And it’s flexibillity that lies behind the addition of a lightweight polo neck to our knitwear range. Made of extra fine Merino wool and available in shades of brown, blue, green and red, these comfortable yet luxurious jumpers can be worn with smart trousers, jeans or chinos, to offer a versatile autumn layer. We’ve also added a deep, satisfying maroon to the navy and grey versions of our popular cable knit cardigan. Among Huntsman’s accessories for the season are slippers in a choice of Green Cawdor tweed or Four Point Star cashmere tweed, in sizes 6 to 11. The result of our third significant collaboration, they are made by hand using signature Huntsman designs and can be worn in or outside, thanks to their leather soles.